…but thanks for asking. In case you can’t read it, Gizmo has a sign on his harness that says “SERVICE DOG do not distract.” Have you ever wondered why? I know I did before I was partnered with my half lab/half guardian angel. I am amazed at how often complete strangers see my service dog (SD) when we’re out in public and race over asking as they come if they may pet him. The shocking thing is that at least 80% of the time when I say “no” they give me a dirty look and go back to what they were doing without saying another word to me. In essence they are saying they have no interest in me, a fellow-human, they just want to play with my dog. A few people are audacious enough to call me names or complain as they walk away. And these are adults, the children usually have better manners. Now, I don’t believe I owe those people an explanation, but just in case you are wondering, I thought this would be a great place to list some of the reasons many of us with service dogs prefer strangers not pet our canine partners. Focus: If he’s playing with you, he’s not focused on his job. SDs do many jobs (balance, medical alert, hearing, etc.) and when he is focused on the exciting new friend who is making silly faces and noises and petting him, he may miss an important cue which could cause serious physical danger to his partner. Even if he looks like he’s sleeping, I promise you a SD is totally tuned in to his partner’s needs, health, and safety. Some dogs need Space: Just like some people, not all dogs like a lot of attention. Some dogs are shy, some are fearful, some don’t get out much and aren’t comfortable around strange people or strange environments. If you see any dog with a yellow leash, bandana, ribbon, or vest, please let them be. There are many reasons why this dog may need extra space. See The Yellow Dog Project or DINO for more information on this global awareness campaign. Inappropriate Time: We understand people are surprised to see a dog in a restaurant, grocery store, bus, hospital, etc, and in their initial surprise, they just don’t think. Many dog lovers don’t realize they are interrupting intimate or business conversations, meals, errands, or keeping us from getting to a doctor’s appointment on time. The SD might be having a bad day: Perhaps people don’t notice it as much when their pets are home or in the yard most of the time, but a SD is within eight feet of his partner 24/7, so we notice every little thing about our SDs. Did you know dogs have off days just like humans? Easily 90% of the time SDs are thrilled to be on the job, but that other 10% –watch out. Sometimes he is coming down with a bug (dogs get sick, too), or he didn’t sleep well because I was up sick most of the night, or he’s just having an attitude that would rival a grounded teenager. Would you want someone petting on you if you were feeling out-of-sorts? I might be having a bad day: People who have a SD do so because they have a physical or mental disability. Many disabilities are invisible, but you need to remember that by definition and by law, if there wasn’t a disability there wouldn’t be a SD. I personally have more than one disability, and some days are worse than others. If I am struggling to walk, concentrate, or carry on a conversation, I guarantee I am not going to be very generous to someone wanting to play with or distract my partner who assists me in those functions. Psychiatric Service Dog: There are so many psychiatric SDs who help with a multitude of disorders (autism, PTSD, anxiety disorders, Schizophrenia, OCD, agoraphobia–to name a few). These canines help their partners manage the symptoms and allow them to function better. Often times the associated disability makes it difficult, if not impossible, to interact with other people, and seeing a dog lover charge over to play with the SD could actually trigger an episode. Although dog lovers mean well, affection toward the dog could be hurtful to the human in ways we can’t imagine. Additionally many folks with cognitive or speech disorders may not be able to communicate why they don’t want strangers to pet their SDs, so please don’t press the issue or assume they are being rude. Before asking if you can pet a SD, consider the situation and the human’s demeanor–if there wasn’t a dog there, would you still walk up and talk to that person? 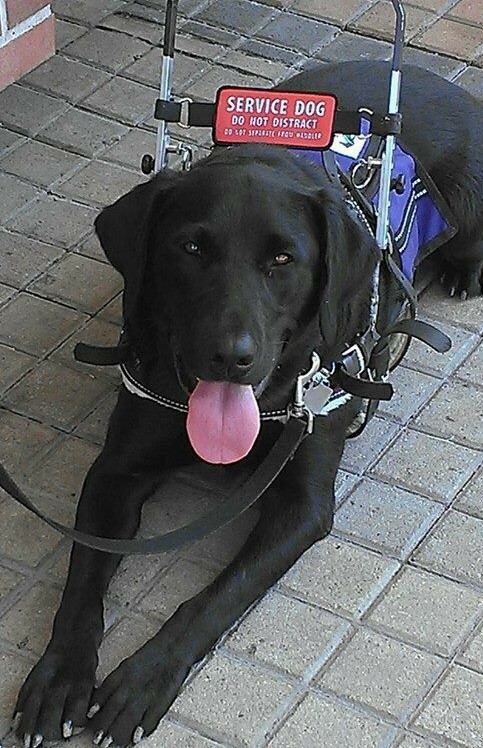 If you want to know more about interacting with service dogs and their human partners, please see the page “About Service Dogs,” and “Dog Lovers, Please Read,” a post I wrote last year that includes a number of suggestions and examples. As more dogs are going into service, your help is needed to get the word out on welcome and unwelcome behavior around SDs. Please share this post and make a SD’s job a bit easier. If you are part of a service dog team, and prefer people not pet your furry partner, please leave a comment telling us why. I am sure there are more reasons than I mentioned. I know most of the time I prefer people not ask. I’m not good in most public places, especially when their over crowded, noisy, smelly…… And I get over loaded sensorily very easily. And when I do i really can’t converse with anyone, and its exaggerated when strange people are asking me impersonal or rude questions. Sensory overload is something I also struggle with due to both my migraine issues and the residual effects of my strokes. Thanks for commenting. Most people don’t realize that this is a big reason some of us partner with service dogs because they can’t “see” our problem. Best wishes to you and your SD!